HCG Drops Diet, or HCG Diet for short, is one of the latest weight-loss hypes in the United States. With extravagant claims of losing 1 lb per day, it has met scepticism, scientific opposition and allegations of fraud by authorities like the FDA Internet fraud team. In case you are wondering about the HCG, what it is and what it is supposed to do, we have reviewed it here. HCG drops are currently banned from the UK market because they contain synthetic HCG hormones of unknown density and quantity. While HCG drops themselves are ineffective, no one can claim that the HCG diets are ineffective. The reason behind the effectiveness of the HCG-related diets is the strict diet plan involving a 500-calorie-per-day diet, which works whether one takes HCG drops, or not. Why LDD instead of HCG? If you don’t have a problem trying a strict 500-calorie diet, there is a far better alternative to the ineffective and potentially unsafe HCG: It is called LDD (Liquid Diet Drops). Liquid Diet Drops are an alternative to HCG Drops. They are based on 100% natural substances and they act as an appetite suppressant that fights cravings and hunger pains. In this way, you can eat far less but keep the discomfort of hunger in check. Through the use of LDD appetite suppressant the 500-calorie diet becomes far more realistic and bearable as an option. Hunger is typically the number one cause which makes strict diets a problematic goal as dieters give up after just a few days. The Liquid Diet Drops solution contains 100% natural, hormone-free ingredients that can not only suppress your appetite and hunger pains, but also provide your body with energy, which is necessary if your diet is limited to 500 calories per day. LDD contains: Astragalus, Beta-Alanine , L-Ornithine, L-Carnitine, L-Arginine, L-Glutamine, Maca, Niacin, Pygeum Africanum and Rhodiola. By applying a couple of drops under your tongue twice a day, the solution will curb your appetite and hunger, allowing you to follow a strict 500-calorie diet per day. The LDD diet plan is split into 3 phases and lasts for 44 days. The most difficult stage is phase 2. Phase 1 – the Loading Period – lasts for two days and this is the time to increase your fat deposits as much as you can by eating all your favourite fatty foods and sweets. Phase 2 – the Maintenance Period – lasts for twenty one days, during which you have to go on a 500-calorie diet per day to make your body consume its fat reserves. You will be able to consume low-fat protein-containing foods as well as certain vegetables and fruit. You must avoid fats and oils, sugar and alcohol. 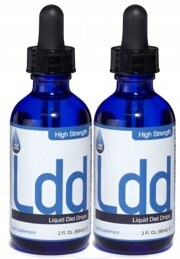 During this period LDD will help you overcome your hunger, suppress your appetite and provide you with extra energy. Phase 3 – the Stabilisation Period also lasts for a further twenty one days, but now your calorie intake can be gradually increased to approximately 800 to 1000 calories per day. After the dramatic reduction in weight during phase 2, phase 3 serves as a stabilisation period during which you will have visible results regarding the reduction of fat in your body. The LDD diet is highly effective due to the significant negative balance between what you ingest and what you consume – in terms of calories. The product is not clinically tested and proven, but dieters who used LDD have reported that they managed to lose up to 1 lb per day and shed their extra pounds fast. The drops contain substances which are known to trigger appetite suppression and keep your hunger under control – something really important for any diet plan to succeed. However, the product doesn’t seem to be the best solution for long-term dieting. It is generally not recommended that dieters lose a significant amount of weight in a short period of time. While for most healthy people this won’t lead to any unpleasant side effects, the dramatic reduction in calorie intake might trigger problems for people with pathological issues. For this reason, it is always best to ask for your doctor’s opinion and advice before you proceed any further with such a strict diet plan. The LDD is a somewhat drastic way to lose a lot of weight in a short time. While the diet is rather “harsh,” the drops will aid on the appetite suppression front – as many users have already confirmed. There is no doubt that the diet is indeed very effective, and how couldn’t it be when 500 calories are one third or one fourth of what one should be normally ingesting in the first place? The LDD slimming method seems to be successful as it makes the body burn its own fat deposits for energy. LDD can be purchased directly from Evolution Slimming. Evolution Slimming is one of the most reputable diet-supplements retailers in the UK and they offer fast delivery and excellent service.